Ms. Sisulu says her government is working closely with the Police and other law enforcement agencies to ensure that security is provided to people living in South Africa. She said her government will work closely with members of the diplomatic corp to ensure that regular updates are given concerning reports of alleged xenophobia. 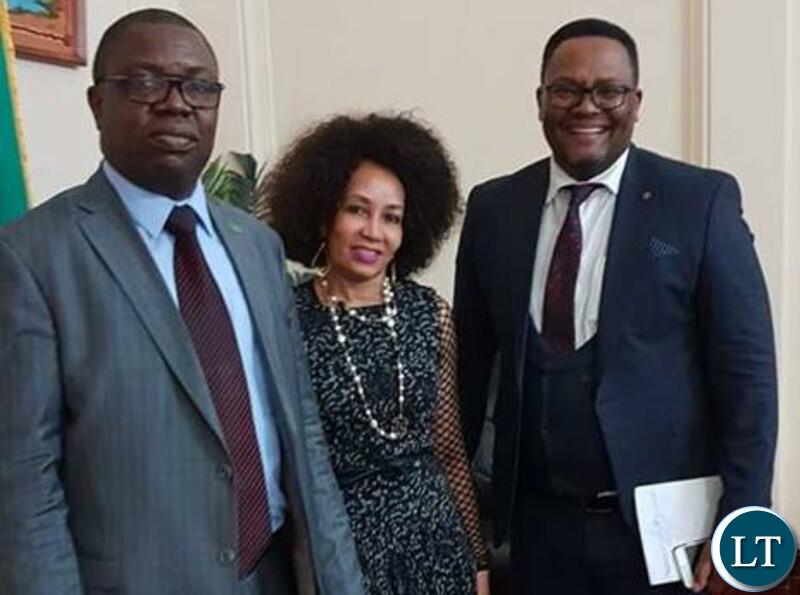 Ms. Sisulu was speaking at an urgent meeting held with Ambassadors and High Commissioners from the African region held at the Department of International Relations and Cooperation in Pretoria. Ms. Sisulu assured that her government will guarantee that all people including foreign nationals were safe. She also stated that Police will ensure that trucks and their trade routes are made safe. The meeting was held in the wake of xenophobic and criminal attacks against foreign nationals in Sprinfield, Durban. Others that attended the meeting was the Police Minister Bheke Cele and his Police Commissioners. And Zambia’s High Commissioner to South Africa Emmanuel Mwamba said reports of alleged xenophobia are distressing. He said some public remarks by identified civic leaders in that country had capacity to incite violence. Mr. Mwamba advised that inflammatory remarks are avoided especially during the sensitive period of elections due on 8th May 2019. He also appealed to government to openly condemn remarks that have been made against foreign nationals as they could fuel xenophobic attacks. Mr. Mwamba added that reports of re-emerging xenophobia in some parts of South Africa were working against the principles espoused by the African Union and SADC that call for free trade area and free movement of people. This is contained in a statement issued to the media by First Secretary for Press and Public Relations at the Zambian High Commission in South Africa Naomi Nyawali. I hate even to go through SA on transit, The blacks in South Africa are just like most Zambians, They respect mzungus more and treat fellow africans very bad. Just bring the boers back. They will sort these savages out. If we had know back in the day, we would not have sacrificed ourselves for these savages. She is hotty one. It’s unbelievable that a land of beautiful women is producing barbarians thugs. I am surprised how Guy Scott was right about these violent young people in RSA, “They have no knowledge of history.” How we placed costly resources at their independence struggles. Samba please don’t talk like you’ve just landed from Mars. Ask yourself why do Nigerians, Senegalese, Malians, Tanzanians, Malawians, Zimbabweans, Europeans, Indians even South Africans working or doing business in Zambia. It’s called exploration for opportunities. Those Zambians in RSA have gone there for various reasons not because Zambia has nothing to offer. Some go there to do business while others are professionals who are in demand by that country. Tanzania is doing better than Zambia but you still find thousands of its citizens in Zambia with some of them going from door to door selling sandals etc. People still go to the DRC in spite of wars. SA hasn’t got everything. That is why they have diversified their business to make money in other countries. Why are they opening chain stores like Shoprite in SADC regions? They want to get opportunities which they are lucking in their countries. It is naivety of the worst kind to insinuate that we can reduce migration to other countries. There students, for example, who have studied Auerotical Engineering and have failed to find employment in Zambia owing to the fact that Zambia Airways is no more. They have opted to go to other countries where their skills will be utilized. South Africans, are just lazy and ignorant people. they killed their fellow South African, in the name of Luck Dube. The reason they gave in court was that they thought he was a Nigerian.What a stupid reasoning!!! The boers knew what they were doing. This is a classic example why people should never meddle in another conutry’s politics. You can not simply unlock a cage because you feel sorry for a lion; you will become its first meal after it exits that cage. If we had a serious government…they would have sent Foreign Minister to RSA by now. If people think you can reason with these savages, they are very wrong. Even this Mwamba would get lynched if he stepped out in public in Durban. You can not reason with savages. What about those who have already been killed? And why react after complaints? That is what they always say. Tell that Minister off….tell her that South Africans should know that they are also in other countries doing business and that they are exposing such to retaliatory actions in the countries the live. I don’t like Guy Scott but his calling the The South Africans as backwards should be nominated for the Best Quote of the Decade. It is very disappointing and sad to witness the ill-treatment of people on the basis of their skin colour and origin. It is even more embarrassing than ordinarily for any responsible South African to be a South African citizen, especially, after several reports about barbarism started emerging, which are only interrupted by usual brief pauses. Many wealthy White South Africans have left South Africa for other safe heavens due to barbarism perpetrated and perpetuated by blinkered South African Blacks. On the whole, the rest of Africa is rising economically whilst the former power house (South Africa) of Africa is gradually sinking, even though it is trying to keep its head above the water level. Just do as the Nigerians did to them…..when the SA government was targeting Nigerians for deportation , Nigeria shut down their banks and other businesses in Nigeria where they had invested billions……the SA government went begging with their tails between their legs to reopen their businesses…. No.9 @Spaka for once I agree with you. That’s the best people action we can take. We won’t attack SA people but we can refuse to shop at shoprite. Anyway their food is full of preservatives and genetically modified food. Yeah…..the Congolese are also waiting for South African registered trucks to burn…. Maybe then ramapohsa will wake up …. Soaks, man u are making sense! That is very true! I meant SPAKA, bro, u are really articulating the truth, South Africans must be taught a lesson. Like Nigeria did, that’s true. That is the only way their government will act…. South Africans are naturally backward, I lived there once and especially the men…..my gosh they are horrible! It’s like u owe them something they want. They hate school and education. Very horrible people. Close KKIA to South African flights ,close down MTN and Shoprite in Zambia if these South Africans won’t stop calling us “makwerekwere’ and killing other Africans. South African businesses should be expelled from ALL African nations. That right, there must be a price to pay for slaughtering other Africans…. Each country that has lost a citizen to these attacks must hold South African businesses in their country accountable. Actually that a very good idea. ZAMBIANS get organised and refuse to shop at shoprite. When news filtered that Boer farmers ‘ were going to be repossessed without compensation, we heard a lot of noise from the Trump administration. But this time around it’s quiet even Yahoo news which carried the farm news for days hasn’t said anything about these attacks xenophobic attacks on Africans.